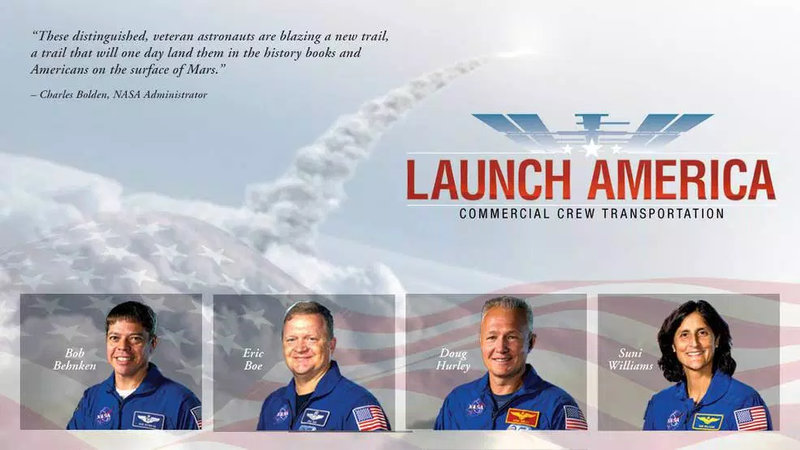 NASA Thursday named the first four astronauts who will fly on the first U.S. commercial spaceflights in private crew transportation vehicles being built by Boeing and SpaceX – marking a major milestone towards restoring American human launches to U.S. soil as soon as mid-2017, if all goes well. The experienced quartet of space flyers will work closely with Boeing andSpaceX as they begin training and prepare to launch aboard the first ever commercial ‘space taxi’ ferry flight missions to the ISS and back – that will also end our sole source reliance on the Russian Soyuz capsule for crewed missions to low-Earth orbit and further serve to open up space exploration and transportation services to the private sector. Boeing and SpaceX were awarded contracts by NASA Administrator Charles Bolden in September 2014 worth $6.8 Billion to complete the development and manufacture of the privately developed CST-100 andCrew Dragon astronaut transporters under the agency’s Commercial Crew Transportation Capability (CCtCap) program and NASA’s Launch America initiative. Under the CCtCAP contract, NASA recently ordered the agency’s first commercial crew mission from Boeing – as outlined in my story here.SpaceX will receive a similar CCtCAP mission order later this year. This post by Ken Kremer originally appeared at Universe Today. It has been republished with permission.